I had a pound of lamb kabob meat and wanted to make kabobs, this is a version of a wonderful Jamie Oliver recipe and was delicious! First bash up all the spices in a pestle and mortar until fine, then mix with the oil to make a thick marinade paste. Put the lamb pieces into a bowl and cover with the marinade. Let them sit there for half an hour to an hour. 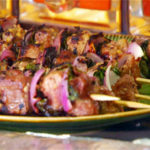 Then, using the skewers, spike each piece of meat alternately with red onion, zucchini and peppers. Grill for around 5 minutes, turning regularly, to give you nicely charred meat on the outside with juicy pink on the inside. Allow to rest for a few minutes before eating. Enjoy!